BIG SALE!! FENG SHUI KWAN YIN STATUES BIG SALE!! Gold Kwan Yin figurine, goddess of mercy and compassion seated on the Lotus Flower from the Indian tradition. She is a symbol of purity, contemplating the divine healing waters of compassion and mercy contained in her vase. Hong Tze figurine in a polished gold finish. Green Faux Jade Kwan Yin figurine, goddess of mercy and compassion seated on the Lotus Flower from the Indian tradition. The Chinese Goddess of mercy and compassion meditates serenely on stylized lotus petals and gives a blessing. Faux jade hues in polished resin finish. Rosewood Kwan Yin figurine, goddess of mercy and compassion seated on the Lotus Flower from the Indian tradition. She is a symbol of purity, contemplating the divine healing waters of compassion and mercy contained in her vase. Hong Tze figurine in the traditional highly polished Rosewood finish. Shiny Gold tone, hand painted Kwan Yin figurine, goddess of mercy and compassion seated on the Lotus Flower from the Indian tradition. The Chinese Goddess of mercy and compassion meditates serenely on stylized lotus petals and gives a blessing. Faux gold plated finish with hand painted color accents. 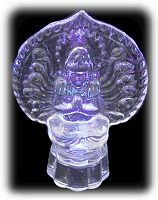 Embossed clear glass figurine of Thousand Arm Kwan Yin manifestation is also a soothing night light when turned on. The goddess of mercy and compassion seated on the Lotus Flower with dozens of open arms is ready to reach out to the needy and suffering. The on-off switch is located inside the base. A soothing light illuminates the statue gently transitioning from red, blue and purple. Packaged with 3 LR41 button batteries included for days of continuous use. A Maternal Gold Kwan Yin holding baby, goddess of mercy and compassion standing on the Lotus Flower from the Indian tradition. She is a symbol of the divine compassion and mercy focused on the young and suffering. Antique gold finish on stone resin statue is gift boxed. The lovely gold Goddess Kwan Yin figurine stands atop a lotus blossom aside a Fu Dog, an ancient symbol of protection and overcoming obstacles, as she pours the healing waters of compassion and mercy from her down turned vase. 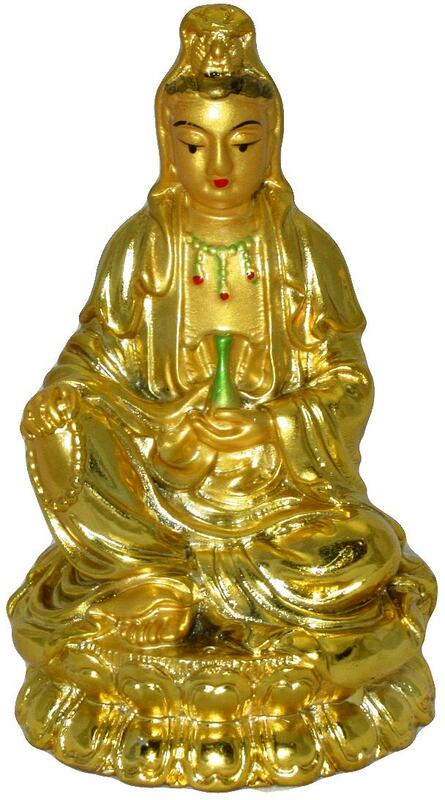 Antique gold or rosewood finish statue in polyresin is gift boxed. The lovely Rosewood Goddess Kwan Yin figurine stands atop a lotus blossom aside a Fu Dog, an ancient symbol of protection and overcoming obstacles, as she pours the healing waters of compassion and mercy from her down turned vase. Antique gold or rosewood finish statue in polyresin is gift boxed. Shining Gold Hong Tse statue of Kwan Yin, Chinese Goddess of mercy and compassion, standing over a large dragon, a symbol of divine wisdom. Her traditional vase is turned down so that it drips her healing waters of compassion and mercy toward humanity, which is combined with the higher wisdom of the Dragon to alleviate life's ills. Antique gold finish on stone resin statue is gift boxed. Gold statue of Kwan Yin in the traditional meditation position sitting atop a lotus blossom centered in the Sacred Flame. She is the female form of the Bodhisattva and sits with prayer beads and an offering bowl. Antique gold satin finish on stone resin statue. Lovely Goddess of Mercy, Kwan Yin figurine, stands atop a lotus blossom as she blesses the home and holds the jar of compassion filled with the people's tears in her other hand. She is a symbol of comfort, forgiveness and purity, contemplating the suffering of humanity. Antique gold finish statue in stone resin is gift boxed.